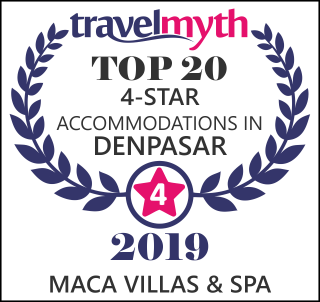 Maca Villas & Spa Bali is an establishment under Maca Group, it is located in Seminyak – Bali, a vibrant area that has become the melting pot for international travelers. Easy access to the beach, smart cafés, fashionable boutiques and after dark hot-spots all vie for space within this stylish quarter. Maca villas itself, not located on the hustle & bustle of Seminyak area, less than 10 minutes walks to the happening area or to Petitenget beach. For whom feels lazy to walk, we have a free shuttle service within the area. Inspired by the concept of a tropical village, Maca Villas & Spa Bali blends 25 private pool villas together with communal spaces within a lush landscape. Each villa has been designed with total privacy in mind and is encompassed within a contemporary Balinese compound featuring a private swimming pool. Seamless indoor and outdoor living spaces capture cool ocean breezes and an abundance of natural sunlight. High ceilings and organic structural materials are balanced by customized furnishings and Bali-inspired pieces of contemporary artistry. All villas include LCD flat screen televisions with satellite channels, iPod docking station, high speed internet and a well-equipped mini-bar. To ensure our guest experience a true Maca service, we provide butler service while guest stays with us. Beside of Maca Villas & Spa Bali, Maca Group also manage Maca Villas and Spa Umalas, located in secluded area of Umalas, approximately minutes away to northern side of Seminyak. Consist of 12 units of 1 Bedroom Pool Villa, 1 units of 2 Bedroom Pool Villa and 5 units of Estates from 2 to 4 Bedroom. Maca Villas & Spa Umalas offers a completely privacy to the guests. Another establishment of Maca Group is SOHAM Wellness Center, a one stop place to balance your body, mind and soul. Whether you’re looking for a weekend getaway, an all-inclusive retreat, or a fit family holiday spot, and regardless of whether you’re an outdoor adventurer, a gym fanatic, or someone seeking the mind-body connection, we’ve got a trip for you. SOHAM Wellness Center s also a place to go, offering world-class fitness facilities and total body workout classes, yoga session, outdoor Olympic-size pool, healthy café, spa and healing treatment, head to toe salon services and a lifestyle boutique. We pay painstaking attention to all those details which make a day spent at the SOHAM Wellness Center such a special occasion. Whatever you need to live life to the happiest, it’s all at SOHAM Wellness Center. Last but not the least is Masé Group (Masé Kitchen & Wine Bar, Masé Uma Kitchen & Bar and Masé Green Café). Masé Kitchen & Wine Bar is named for restaurant at Maca Villas & Spa Bali. A charming fine dining venue with wide selection of wine collection, perfectly pairing with International and Asian fusion menu. Masé Uma Kitchen & Bar is named for restaurant at Maca Villas & Spa Umalas. A serenity place to escape from your daily life and casual venue for gathering. Masé Green Café at SOHAM Wellness Center. We believe that good nutrition is an important part of leading a healthy lifestyle. Combined with physical activities we offered, the healthy food can help guest to reach and maintain a healthy weight, and promote the overall health. For more information or media query, please email to dosm@macavillas.com or call to +62 361 739090.